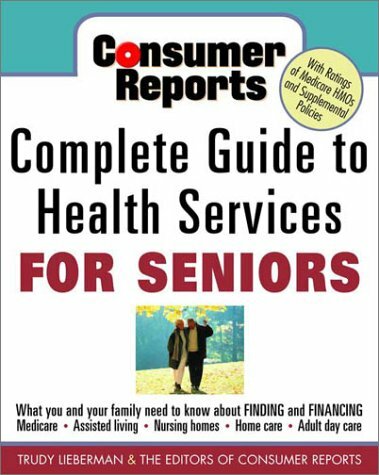 A consumer's guide to the complexities of the health-care system for older Americans offers an objective, practical evaluation of a variety of health care, assisted living, and nursing home options in a helpful handbook that includes worksheets, charts, and comparison tables. Original. 15,000 first printing. Whether you're exploring options for yourself or for your aging parents, you know that navigating the world of health care services and long-term-care facilities can be a daunting task. Consumer Reports, unrivaled in its unbiased expertise, provides the essential guide to getting the best care. * The ins and outs of paying for health care services, including Medicare coverage and insurance options. * How to find the best long-term care, whether at home or in the community, whether you're looking at assisted-living facilities or nursing homes -- and how to pay for it. * City-by-city ratings for Medicare HMOs and Medicare supplement insurance policies, as well as a guide to how well your state is monitoring nursing homes. * Easy-to-use worksheets and tables to help you figure out your assets, judge an assisted-living facility, compare home care costs, evaluate an HMO drug plan, and much, much more. * Comprehensive appendixes to guide you to state-by-state information on insurance counseling, advocacy groups for the elderly, other helpful organizations, and more. TRUDY LIEBERMAN, a journalist for more than thirty years, is director of the Center for Consumer Health Choices at Consumers Union, the parent organization of Consumer Reports magazine, and author of How to Plan for a Secure Retirement and Slanting the Story: The Forces That Shape the News. She is one of the country's leading investigative journalists today writing on health care issues, and she has received numerous awards, including two National Magazine awards and ten National Press Club awards. Other books from the Consumer Reports library include the Consumer Reports Money Book, Consumer Reports Guide to Baby Products, and the Consumer Reports New Car Buying Guide.